A Dual-Clamp Tripod is good if you have a particularly heavy piece of equipment for added security of having both screw and quick clamp types of clamps. Tri-Max tripods are certified to meet or exceed ISO Certification Standards - making it the only tripod on the market with certifiable accuracy. All new Tri-Max tripods come equipped with a serial number on the hinge assuring you that the tripod has successfully passed all necessary testing and is certified to meet the ISO 12858-2-H standards. Seco has now put the Tri-Max to the ultimate test, the ISO 12858-2-H. Not only did Seco test the Tri-Max, but they tested nine of the best selling tripods on the market. The results were gratifying; the Tri-Max was the only tripod that passed the test. Seco is so convinced of the accuracy and stability that the Tri-Max can provide, they back it up with a 5-year warranty. As instruments become more accurate, tripod stability becomes more important. 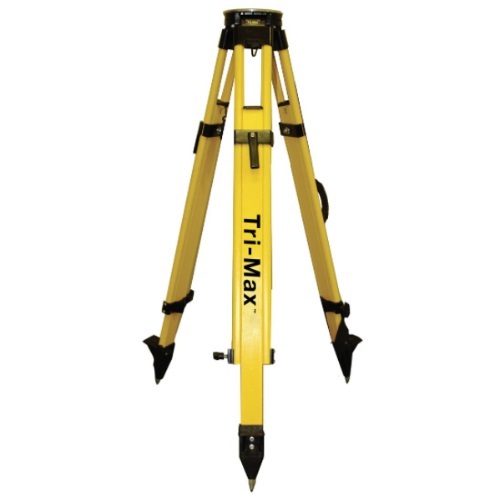 The horizontal accuracy of any surveying instrument can be directly affected by the stability of the tripod used with it. Without exception, no other tripod even comes close to delivering the stability and performance of the Tri-Max tripod! The patented Tri-Max is truly a next generation tripod and is the only tripod that will truly meet your needs! With rugged construction throughout, the design features premium materials including advanced fiberglass composite. The Tri-Max outperforms all other tripods for functionality, special applications, accessories, and ergonomics. Thank you Engineer Supply for shipping on time and getting this tripod to us undamaged. We had other suppliers online ship and the product arrive damaged. You took extra care with our order.